This is the third post in our Fantasy Portfolio series of blog posts (read one and two if you’d like), in which we will create a dividend growth portfolio from scratch and then track it over time. Today we’ll discuss dividend safety. First of all, what is dividend safety? Dividend safety means that the dividend is unlikely to be cut in the near future. Dividend cuts are bad for three reasons: first, and most obvious, it means your dividend income stream decreases. Second, dividend cuts are almost always accompanied by a significant drop in share price. Finally, dividend cuts casts concern on the underlying business strength and future prospects of the company itself. While there is no test that can say with 100% certainty if a dividend is safe, the financial metrics that we’ll discuss in this blog post will help you evaluate the strength of the dividend stream of stocks in your portfolio or watchlist. 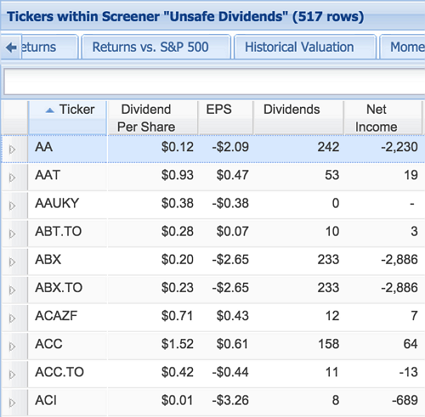 Once we’ve discussed dividend safety, we’ll then create a template to apply to stocks that we are considering for our dividend portfolio, in order to make sure we’re including only healthy dividends stocks in our portfolio. The first thing to note is that dividend safety is linked to overall financial health—you can’t have a safe dividend in an unhealthy company. In order to continue paying reliable dividends, a company needs to continue to post earnings that comfortably allow them to continue paying that dividend. Additionally, if a firm has debt, it must first service the interest on its debt, and only then can it use the leftover cash to pay dividends. Thus, in order to gain a well-rounded perspective on dividend safety, we’ll be looking at earnings, cash, and debt metrics, in addition to those directly related to dividend payouts. If you do any sort of research on dividend warning signs, you’ll very soon encounter the conventional wisdom that a situation in which dividends are higher than earnings is a bad sign. This is because earnings are the lifeblood of a company: they allow the company to reinvest in its business so it can continue to grow—without earnings, the company would need to take on debt instead, which adds risk and can eat up earnings in the future. Additionally, earnings growth gives shareholders a boost of confidence, and thus can buoy the share price and make it easier for the firm to raise more capital. When dividends are higher than earnings, it shows that the company hasn’t been able to make the amount of money that it has promised out to shareholders. However, like most hard and fast rules, this one isn’t 100% true 100% of the time, and the reality allows for some nuance (which of course means a bit more work on your part is required). It’s true that if dividends are higher than earnings for an extended period of time, then eventually it’s very likely that the stock will have to cut its dividend at some point. Below, you can see some stocks in Stock Rover that would meet this “warning sign” criteria—notice that their dividends per share are higher than their earnings per share (EPS). An equivalent way to compare dividends and earnings is to look at the Dividends column against the Net Income column. However, one period of dividends higher than earnings does not necessarily portend dividend catastrophe. If the firm has low earnings but strong cash flow (which could be the case if the firm has a lot of non-cash charges such a depreciation and amortization), it can use the cash to cover its dividend bases. Additionally, it’s possible that the company has set aside earnings from previous periods that cover future dividends, so in that case the company’s ability to pay current dividends is not linked to current earnings. If a company is using earnings from previous periods to help cover the current dividend, we also need to consider the strength of a firm’s retained earnings (a balance sheet item), as well as current period earnings (also called net income, which is an income statement item). It is essential to have a thorough understanding of how each company expects to meet its dividend obligation, especially if current earnings are insufficient. In order to find out what’s “under the hood,” so to speak, you can look in the SEC filings. Regardless of the source of dividend payments and whether or not you’re looking at earnings and/or retained earnings, it is important that the stock has been able to consistently increase its earnings, as they are the engine that keeps the whole business running. For this, you should look at their earnings growth against the industry average, to make sure it’s not lagging behind its peers, as well as earnings growth over time to make sure it’s not decelerating. Once you’ve checked the earnings, you can go one level deeper to look at the relationship between earnings and dividends. The Payout Ratio is just the ticket, as it’s the dividends divided by earnings, or essentially the percentage that dividends are taking out of a firm’s earnings. Again, the number you most often see floating around is that a payout ratio above 50 is a warning sign (meaning that the firm is paying more than 50% of their earnings out in dividends), but again, it’s not so cut and dry; the Payout Ratio is sector- and industry-specific, so it should be compared against those of its peers. Additionally, the Payout Ratio is just a snapshot, and looking at a snapshot never tells the whole story, so it’s important to look at how it has been evolving over time. If the Payout Ratio is creeping up year after year, or quarter after quarter, it may signal that the current dividend is putting a strain on the company’s financials. You can also chart the Payout Ratio (found in the fundamentals menu). For this particular company Albermale (ALB), you can see that the Payout Ratio was quite high around January 2009, then decreased, but has been slowly increasing over the past five years. ALB’s current Payout Ratio is 27.7%, which doesn’t seem too high based on general guidelines, but it’s hard to know without seeing how it stacks up to firms in the same industry as this stock. In order to quickly find out the sector and industry, you can to turn on the ticker information tooltips for the Table( in this case, ALB is in Specialty Chemicals in the Basic Materials sector). Then, to find the Payout Ratio (or any metric value) for its entire industry, we can load all of the industries within its sector into the table (by clicking on “Basic Materials” in the Navigation panel), then find the Specialty Chemicals row and see the value for the industry as a whole. Below, you can see that Specialty Chemicals (highlighted) has a Payout Ratio of 29.1%, so even though ALB’s Payout Ratio has gone up, it’s still below the average for its peers. Instead of looking at the value for the industry as a whole, another option is to look at the individual Payout Ratios of the stocks in the same industry, via the Peers tab in the Insight panel. 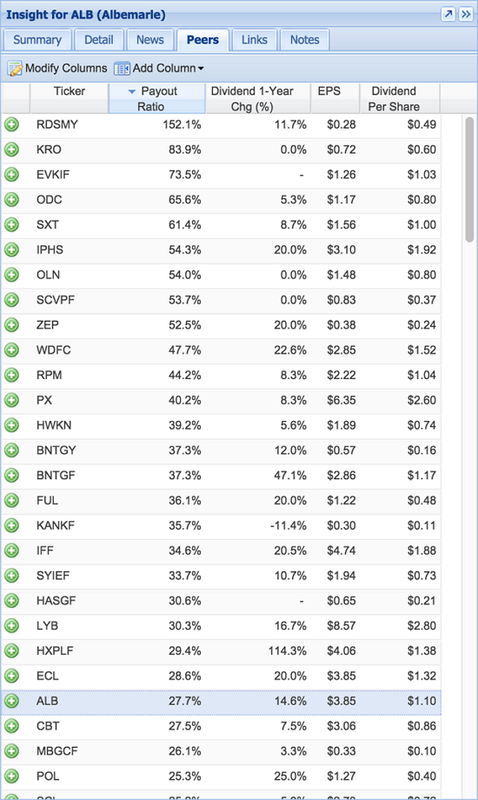 Below you can see I’vemodified the columns to show only the ones I’m interested in (Payout Ratio, Dividend 1-Year Change, EPS, and Dividend Per Share) and then I’ve sorted by Payout Ratio to see where my stock (ALB) is situated. Let’s take a quick look at some cash metrics as well. The firm will need cash on hand in order to actually distribute the dividends, so these are important to check to make sure there’s not a liquidity problem that would interfere with the dividend payments. Additionally, some businesses are more capital-intensive than others. Capital-intensive businesses (think Intel) and business that like to acquire other businesses (think Oracle or Facebook) will have higher depreciation and amortization expenses, which will in turn will decrease income statement earnings, perhaps giving the false appearance that the company will have trouble paying its dividend, when in fact they have ample cash. In cases such as these, cash flow would be a better metric for dividend safety than earnings. To assess cash and dividends, we’ll look at the cash dividend coverage ratio, which is calculated as the cash flow per share divided by dividend per share. It too has a general rule of thumb, which is that it should be above 1.2—meaning that there is 1.2x the amount of cash on hand as would be needed to pay dividends. Like the Payout Ratio, it’s helpful to look at this over time, and to compare it to stocks in the same industry (using the same methods in Stock Rover as described above). If it’s decreasing over time, this could be a worrisome sign because it means more and more of their cash would be going to dividend payments. But, like all metrics, this only gives a narrow view into the dividend situation, and should only be used in conjunction with other measures, or ideally with an understanding of the firm’s income and cash flow statements. The cash dividend coverage ratio is available as a custom metric in Stock Rover. A popular metric that looks at the overall debt structure of the company is debt/equity—it will be higher if the company has more debt. Like many of the other metrics we’ve discussed so far, this can vary greatly by industry, so it should always be compared with peer stocks to make sure it’s in a comparable range. Even more importantly, it should be looked at over time to ensure it’s not increasing. The quick ratio is a common measure of short-term liquidity, and it’s calculated as (current assets – inventories) / current liabilities, so essentially how much of a firm’s liquid assets could cover the current liabilities—the higher the quick ratio, the less likely that there would be a liquidity crisis. There isn’t a widely-accepted level for this metric, but in general it should be above 1 to avoid liquidity problems. This metric is available to all users in Stock Rover, just add it to the table with the Add Column button. The Interest Coverage ratio specifically looks at a firm’s ability to pay off the interest on its debt from current earnings, and is calculated by dividing earnings before interest and tax by the total interest payable. The larger the ratio, the less likely a company would be to default on its debt. Anything below 1 would be a serious warning sign, because it means that the company is not earning enough operationally to cover the cost of the debt service, let alone dividends. Lastly, and finally, let’s take a look at some dividend metrics themselves to analyze the history the history of dividend payments, starting with dividend per share. Are there any interruptions in the dividend? Because if there are, it could indicate that management historically has not done an adequate job allocating its resources and thus casts doubts on their ability to protect the dividend in the future. Even if the dividend hasn’t been interrupted entirely, it still may have had ups and downs, which is a troubling sign. Ideally the dividend should not have been decreased at any time. On the flipside, if the firm has been able to consistently maintain and grow its dividend, it means that the company has effectively managed their resources, and most likely will continue to do so in the future. For this, you can look at the dividend growth metrics in Stock Rover (we have the 1, 3-, and 5-year). While currently inflation is very low, this is not always the case and it’s important to note that the dividend should be growing at least at the rate of inflation, lest you lose money on the real value of that dividend. We can also look at dividend yield. We discussed this more thoroughly in the last post, but I wanted to take a moment here to reiterate that if the yield is higher than usual, that could be a risky sign because it means that the price has fallen, possibly because investors think the dividend will be cut, or because they are bearish on the stock in general. However, it’s possible that the price is low for some other reason—because yield can be so variable, it’s necessary to compare the current number against the stock’s historical average. Now that we’ve touched on various parts of dividend safety, here is a quick checklist that we can run through once we’ve found a dividend stock that we like. Growth continuing, or (ideally) accelerating? At or below industry average? At or above industry average? At or below the industry average? No previous decreases in dividends? Growing dividends above the rate of inflation? Yield on par with historical average? In an ideal world, it would be best to go through this list (or something like it) in order to have a deep understanding of what is going on behind your dividends. At the very least, do a quick overview of the metrics I mention in this post, and see if there are any red flags. If you’re concerned about the very near-term future of the dividend, you can focus on the liquidity metrics (Quick Ratio, Interest Coverage) and take a quick look at the dividend history. Now that we have a general outline of analyzing dividend safety, we’ll move on and actually start picking some stocks! In the next post we’ll develop a dividend screener, and then once we have several candidates, we’ll do a deeper dive, with dividend safety first.